Never has there been a time in human history where more can be known about an individual without actually and very rarely experiencing their full relational presence. We just like God can be right there without others in the room sensing and experiencing our true presence. In the 1970s, Astral Projection and OBE (Out of Body Experience) became a big thing, which isn’t all that surprising when you consider that it coincided with a lot of drug experimentation. This illustration to introduce the concept of God being omnipresent, fully present everywhere all the time, was lost on many of my middle school students. They couldn’t quite get past what would happen if your body needed to go to the bathroom while your spirit was floating around Antarctica watching the penguins march. I suggested that it would be advisable to only practice astral projection while sitting on the toilet just in case. While I don’t actually give much credence to OBE, you have to admit it resulted in some of the Beatles best work. 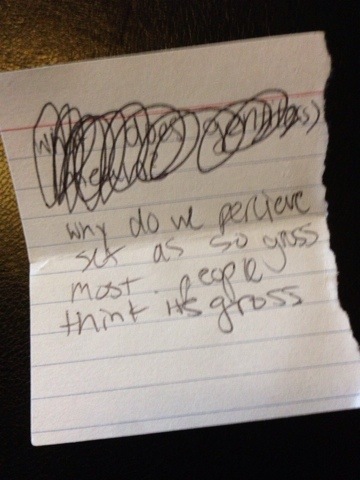 Still, my students have a point. If your soul really could float away from your body for a brief jaunt it would be a very disconnected experience. Your body would sit there like a vegetable while your spirit is just floating around eavesdropping on the world, neither having enough presence to actually have an impact because you are literally two places at once. In reality what I just described above is not all that different from our current cultural phenomenon of social media. Instead of Astral Projection we now have Digital Projection. Our bodies are walking, working, eating, and even interacting with others while our spirits are floating around the digital dimensions eavesdropping on the world. Neither having enough presence to actually have an impact because you are literally two places at once. I’ve caught myself on numerous occasions having a virtual out of body experience detached from what was happening right in front of me because the deepest parts of me were consumed with the digital dimensions I inhabit. I’m not suggesting that we throw off social media and all the things that divert our attention from what is happening right in front of us. Social media is not evil and will not be the catalyst to the decay and demise of human society. However, I do find it interesting that we live in the very same tension with one another that we as Christians often struggle to understand about God. “If God is fully present everywhere all at once then why doesn’t he step in more often?” It’s haunting how often that can be said of us. Never has there been a time in human history where more can be known about an individual without actually and very rarely experiencing their full relational presence. We, just like God, can be right there without others in the room sensing and experiencing our true presence. The question we must ask ourselves at any given moment is why we don’t step in more often? Let me qualify everything I’m about to say by first saying that I have not seen the movie God’s Not Dead yet. This is not a movie review nor is it meant to discourage anyone from going to see it. From talking to some friends who have seen it, I understand there are some redeeming things about the movie and the story it presents. Amongst them is the fact that the main character is willing to stand up for what he believes in and takes the time to research and find answers to difficult questions posed by the antagonistic philosophy professor. I find it interesting that Focus on the Family’s movie review website, Plugged In, had this to say as the negative elements of the movie “Pretty much everyone who’s not a Christian in this story is villainized for being mean, abusive, grouchy or narrow-minded. Several such sinners are condemned to either death or terminal illness, as if they’re being punished for their attitudes.” As much as that bothers me and could be topic in and of itself or a blog—the portrayal of non-Christians in Christian movies—that is not the issue I have with this movie. Surely there are professors that are antagonistic towards Christianity and organized religion in general. Many of them have published works that provide their explanations of why they think faith in a deity is intellectual suicide. I don’t doubt that many of them don’t shy away from sharing their antagonistic attitude in class. That being said, they are still professional. In any philosophy class you are not tested and assessed the same way you are in a math or even a science class. The field of philosophy does not require that you subscribe to the worldview of your professor. It does however require you give a rational support and or explanation of the worldview you’ve chosen. Thus the premise presented in the movie of a professor demanding that students deny God or gods completely at the outset of the semester is extremely far-fetched. Still that is not what bothers me the most. For a number of years we’ve been warned that philosophy and professors of the sciences pose a major threat to Christian college students. We’ve been told that these cunning men and women are the main ones responsible for the often quoted statistic of somewhere between sixty to seventy percent of young Christians leave the church by their second year of college, a third of which never return. Yet in all my years of doing youth ministry—as a student, volunteer, and a pastor—I’ve yet to know of anyone who walked away from following Jesus Christ because of what they learned in a college philosophy or science course. On the other hand, I know a multitude of persons who have walked away from Christianity, all of whom walked away for one of three reasons. The second reason is that they encountered some sort of tragedy or crisis, often the divorce of their parents or death of a loved one, and became either disillusioned with by God’s seeming disregard for their troubles or angry with him. It became easier to walk away than wrestle with what the Bible says about the present age and the age to come, namely the paradoxical reign of Christ on earth (the paradox of Jesus reigning on earth while there is still evil and suffering in the world) while yearning for the overflowing reign of Christ on earth where pain and suffering will be no more, and death will be defeated. Often times they’ve been handed a faith that says you suffer because you’ve been bad and God is punishing you. Ironically enough, this is where some adopt the Anosticism which says, “if there is a God who created the earth he or she is now totally uninvolved in the affairs of the earth”. My point in bringing this to the table is this… Let’s stop blaming liberal college professors for the failures of the church, youth ministries, and parents. Nancy Pearcey in her book Total Truth: Liberating Christianity from its Cultural Captivity summarizes the problem quite well, “it remains true that most churches are strong on teaching about conversion, but weak on teaching about how to live after conversion.” If anything college, or more to the point independence, is the testing ground of faith and the gospel message young people have been taught to believe. A gospel that primarily teaches you to modify your behavior is usually heavy on guilt and light on grace. A gospel that primarily teaches you that Jesus came to make your life better is light on hope for a world that is perishing and the cost of discipleship. A youth ministry primarily focused on having fun is going to yield young adults in search of more fun and entertainment. Sermons on how you’re blessed or claiming your blessing are light on telling the story of how God set out to bless the entire world and why it needed to be blessed in the first place. Parenting driven by fear of what could go wrong is light on talking about how the world went wrong and what God does about it in the past present and future. We need to present our young people with a robust gospel that fosters disciples instead of converts and well-behaved kids. We need to own our failures instead of blaming them on people and institutions that weren’t around for the formational period of young adults lives. Otherwise, God’s Not Dead will be wholly accurate in their depiction of a young adult who has to go search for answers to tough questions in isolation, instead of in loving community, or abandon their faith all together. Darren Aronofsky’s Noah starring Russell Crowe in the title role debuts tomorrow. Call me skeptical but there are people who are ready to drown this movie in criticism. It would come as no surprise to see many, particularly Christians, walk out of the movie disappointed. There likely will be those who feel as though it has strayed too far from the narrative it seeks to depict in Genesis 6-9. There likely will be those who feel the writers and director have taken too much creative license. There will likely be those who in the anti-Christian sentiment think it’s ridiculous and absurd to suggest that this story is anything other than fairy tale nonsense that didn’t merit getting the silver screen treatment (then I certainly hope they haven’t seen God’s Not Dead). I’m looking forward to going to see Noah. Having grown up in church the telling of Noah typically got the felt board treatment and the cute cuddly kids book treatment. It wasn’t until I taught Genesis to students as a youth pastor that I realized that the story of Noah is not for children. It is ultimately a story about human depravity and what can possibly be done to fix a world in which the caretakers are the problem. 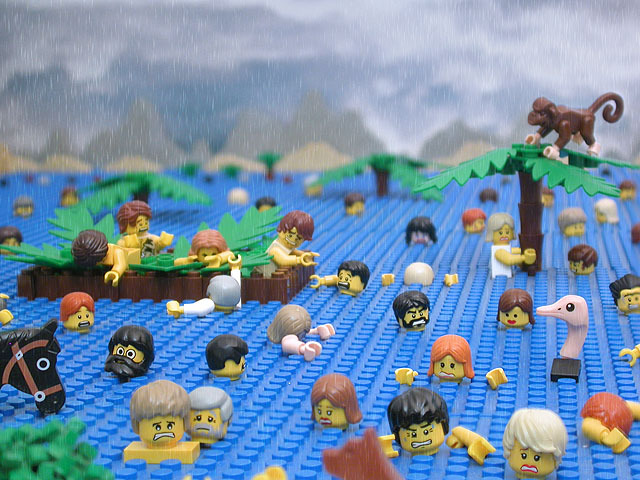 To this point I haven’t found anything that captures this better than the Lego produced depiction of the flood in The Brick Testament. Showing that to students helped them realize for the first time that there is nothing cute about the story of the deluge and Noah’s ark. In more ways than one it is messy. I fully expect, even within the confines of a PG-13 rating, that Darren Aronofsky will not shy away from the implied violence in Genesis 6-9. I fully expect he will take some creative license, no different than and no more egregious than the license Cecil B. DeMille took in writing and directing the much celebrated by evangelicals The Ten Commandments. Aronofsky has a lot less text of scripture and details to work with than DeMille. Unlike Demille, to my knowledge Aronofsky has never professed to be a Christian. I’m curious to see how someone, in particular an artist, whom I presume is not a Christian tells the story. All that being the case, it’s a movie and if I’m going to pay in excess of $10 to see it I want a good story, a well told story, and certainly not least to be entertained. So if you are going to see the movie, try to go into with as few expectations as possible and try to enjoy. Be critical, but not for criticisms sake. Lastly here are a few things to keep in mind when you do critique it. Remember the Source—In this case I don’t mean the Bible. Darren Aronofsky is not a guy that is new to making movies. You might not be familiar with his name but there is a good chance that you are familiar with some of his work. He is the director of Black Swan starring Natalie Portman (for which she won the best actress Oscar), The Wrestler starring Mickey Rourke, and Requiem for a Dream. All three of those movies garnered at least one acting Oscar nominee. All three movies didn’t shy away from showing the dredges of human depravity (in particular Requiem for a Dream which is a very well done film that I will never watch again because of how dark and depressing it was), and like I said at the beginning Noah is a story about human depravity. All of that to say if you aren’t a fan of his previous work then chances are you won’t like or appreciate his latest work. Personally I’m a little surprised he decided to keep it PG-13. And Remember the Source—In this case I am referring to the Bible. Genesis 6.5-6 gives us a brief description of what was happening in Noah’s day, “The Lord saw that the wickedness of man was great in the earth, and that every intention of the thoughts of his heart was only evil continuously. And the Lord was sorry that he had made man on the earth, and it grieved him to his heart.” The rest of Genesis 6, 7, 8, and 9 is a telling of God calling Noah to build the ark, instructions or a blueprint for building the ark, the deluge, it subsiding, God making a covenant with Noah, and Noah’s descendants (including the brief story of his son Canaan’s transgression against him while he was passed out drunk). It’s an Adapted Screenplay—Obvious by now you know this movie is adapted from another source, but often times those are the movies of which it is most often said, “Well, it just wasn’t like the book”. Which at this point in some ways is lazy criticism. Most books wouldn’t translate well on the silver screen if they played out exactly the way they are written. That is why they are “adapted”. Director Peter Jackson, often maligned for his adaptations of Lord of the Rings and The Hobbit, once said in response to detractors that if he actually included everything from the three LOTR books in the movies they would be 20 plus hours long all together instead of 12. Now of course he is getting criticized for doing just that with the one book, The Hobbit. It goes to show you you just can’t win when you adapt a well known book into a movie. At the end of the day regardless of what a director trims or adds the main question shouldn’t be “was it in the book?” The main question should be, “does what the writers and directors decided to trim or add help keep the movie moving?” The movie shouldn’t grind to a halt trying to include every detail. Nor should it pass over important information or scenes that help tell the story and or build characters. A good story requires a conflict that needs to be resolved and most conflicts involve an antagonist. In the Bible we are not given a specific antagonist other than the general ‘man’. Judging from the previews the writers have decided to create an antagonist who embodies everything that has gone wrong with mankind. They aren’t doing it to tick off those who treasure the Bible as God’s inerrant word, no more than Bill Cosby was when he did his Noah routine in stand up comedy. They are doing it for the sake of telling the story through the medium of film. I hope to see Noah sometime this weekend in which case I’ll attempt to post a review.